The three devices can be pre-ordered today, but one can only book them via online pre-paid options since Cash On Delivery is not available. Xiaomi is trying to make good on its promise of making its devices available in abundance for the customers. The company is hosting a pre-order for the Redmi 5A smartphone, Mi TV 4 and the Mi TV 4A. The pre-order is essentially another flash sale but the booked devices will be shipped out to users within 5 days. Additionally, users can’t change the delivery address after placing the order and need to pay for it online as the COD option will not be available. 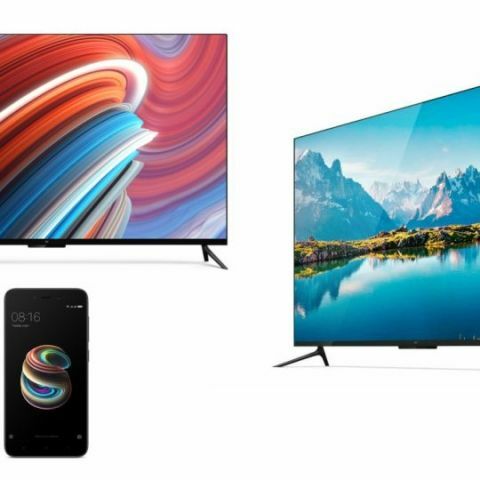 Xiaomi launched its first television offering in India, the Mi TV 4 in February and later in March unveiled the 32-inch and 43-inch Mi TV 4A. The Xiaomi Redmi 5A is powered by the Qualcomm Snapdragon 425 SoC clocked at 1.4 GHz and features a 5-inch HD display. It packs a 3000mAh battery, which claims of delivering up to 7 hours of video playback and up to 8 days of standby time. It supports expandable storage of up to 128GB via a microSD card and has a separate third slot for it. In terms of optics, it is equipped with a 13MP primary camera, which is supplemented with an LED flash and supports Phase Detection Autofocus (PDAF). On the front is a 5MP camera with f/2.0 aperture. The dual-SIM device runs on MIUI 9, based on Android 7.1 Nougat. Read our Redmi 5A review here. The Mi LED Smart TV 4 features a slim, thin-bezel design and runs on Patchwall OS, which is a fork of Android, however, there is no Google Play Store support. It is powered by a 64-bit Amlogic Quad-core CPU with Mali T830 GPU and it features a 55-inch 4K HDR display with a 10-bit panel and 60Hz refresh rate. For audio, it is equipped with 16W speaker and boasts of Dolby + DTS Cinema quality. Connectivity options include dual-band Bluetooth 4.0, Wi-Fi, 3-HDMI ports (1 ARC), 1-USB 3.0 port and 1-USB 2.0 port. It offers a smarter set-top box experience with localised content in 15 Indic languages. You can check out our review of the Mi LED Smart TV 4 here. Read our spec comparison of the Xiaomi Mi LED Smart TV 4A 43-inch vs competition here. There are two variants of the Mi LED Smart TV 4A and the two are more or less the same, except the obvious difference in screen size, and a couple of features. The new Mi LED Smart TV 4A series comes with 1GB RAM and is powered by a 64-bit quad-core Amlogic processor with 8GB of onboard storage. They feature 20 Watts stereo speakers (10W x 2) and support DTS sound. The 43-inch variant of the new Smart TV 4A series can handle full HD video playback, whereas the 32-inch model can play HD ready (720p) videos. In terms of connectivity, both the variants support ethernet, earphone out, Wi-Fi, and AV port. The 43-inch model comes with 3 USB, 3 HDMI and an S/PDIF port, whereas the smaller variant features only 2 USB ports with 3 HDMI ports. Running on Patchwall OS, the TVs features content from 15 Indian languages, supports universal search and infinite scrolling as well. There is also the Mi Remote which features a minimalistic design with 11 buttons.